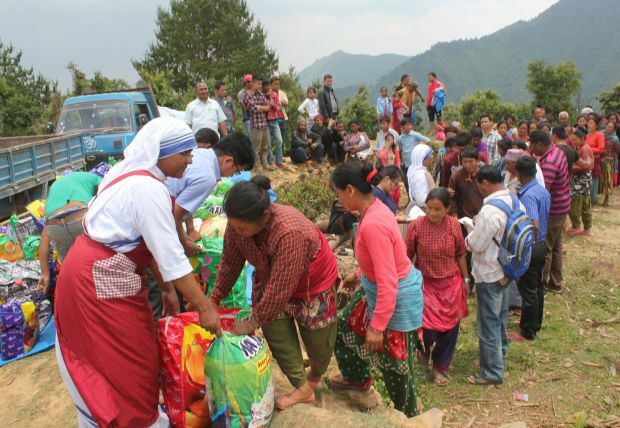 KATHMANDU, Nepal (CNS) — Members of the Missionaries of Charity had to spend more than two hours waiting at police headquarters for clearance before they could deliver food, blankets and other promised relief to earthquake victims in a remote mountainous area of Nepal. The group of six sisters, eight brothers and about six volunteers had asked for police accompaniment on their May 16 mission because, on an earlier trip, they had been accosted by looters while carrying aid to people trapped in the mountains overlooking Kathmandu Valley. But from the Missionaries of Charity center for destitute women at Mitra Park in Kathmandu, the police escorts diverted the vehicles carrying relief material to police offices in Lalitpur District, one of the three districts in the Kathmandu Valley. The officers insisted that government permission was required for relief distribution. After the intervention of Bishop Paul Simick of Nepal, Chief District Officer Yadav Prasad Koirala let the group get on their way but warned that, in the future, the missionaries should leave relief distribution to the government. The nuns told the officials that they had distributed aid to more than 200 families in the Khani Dhanda mountain area and, with Catholic youth, had trekked eight hours to identify other needy families who had not been reached by relief groups. “This is the first time we are facing such a situation,” Sister Marica told Catholic News Service as the convoy of five vehicles took to the dusty mountain path to Khani Dhanda. Sister Armelle, the most senior of the Missionaries of Charity in the group, explained that they had purchased relief material from the market according to the requirements of the people after their preliminary visit. Rice, tarps, woolen blankets and other materials were packed into kit bags for distribution. “In some areas, they asked for utensils. In other places, they asked for more rice,” Sister Armelle said. When the convoy reached Khani Dhanda, the Missionaries of Charity brothers unloaded the 140 kit bags, while the sisters lined up those who had been given coupons on the earlier visit. Elderly women carried the relief materials in cane baskets on their heads. The Catholic Church is a major provider of relief in remote areas of Nepal after thousands of people lost their lives and thousands more were injured in a magnitude-7.8 earthquake that hit the capital Kathmandu and its surrounding areas April 25. The earthquake was followed by several aftershocks, including one that measured 7.3 May 12. Rebello said it had taken him two days to travel to the India-Nepal border to release more than 10 Caritas and Catholic Relief Services supply trucks from India that were held up at the checkposts.